Can we talk about soft fruits, please? Summer is an incredible time for fruit, with some of our favourites being at their finest. But whilst I adore local fruits, like raspberries and strawberries, we can all agree that peaches are one of the finest things around, right? With peaches everywhere in the shops just now and apricots abound, it felt like time to bake. 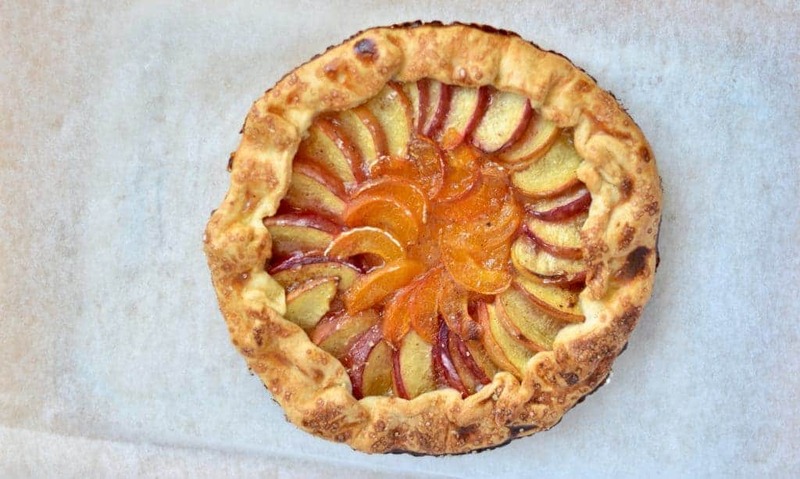 Roll on a peach and apricot galette. Galettes are not widely known in my part of the world, but they are part of the rustic side of French cooking that I adore. 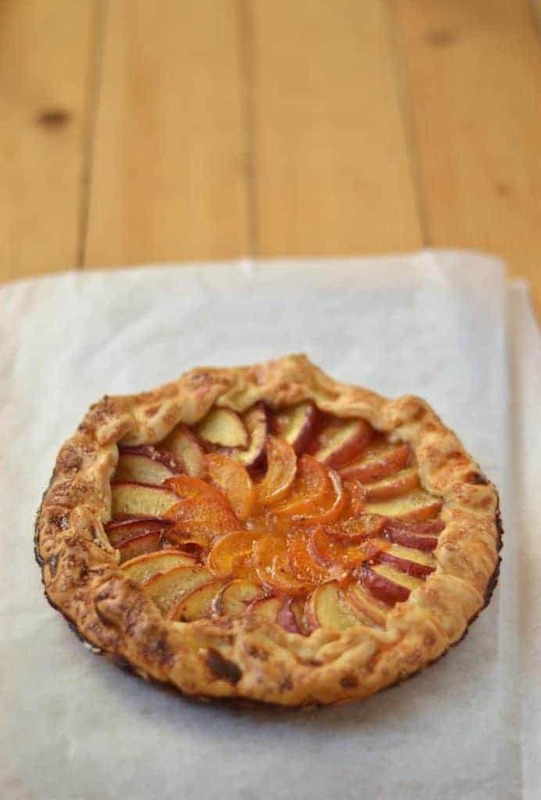 You can think of a galette as a bit of a cheat’s approach to making a pie, as it’s essentially making something that is a cross between a tart and a pie. It’s got a base, it’s got edges, and some of it’s got a top. But it’s all one piece of pastry so the centre is open, and it’s where you can see the golden, glistening, caramelised fruit. Excuse me a sec, I think I might be having a moment. There are two approaches to making this peach and apricot galette: the one I took that involves quite a lot of standing over the dish and laying out the slices in perfect circles that’s for that perfect styling (perhaps you could call it the ‘Paris approach’); or you could pile all the slices in together and properly mix it up (the somewhat more rustic and less time-intensive approach). There’s zero judgement here, if I hadn’t planned on taking photos of it, I would definitely have taken the faster route. 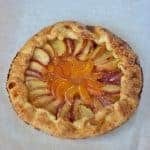 For me, the flavour combination of the peach and apricot galette was hard to resist, but if you’re not a fan of one of them or simply just have a pile of peaches that need using up you can easily make it with just one type of fruit. 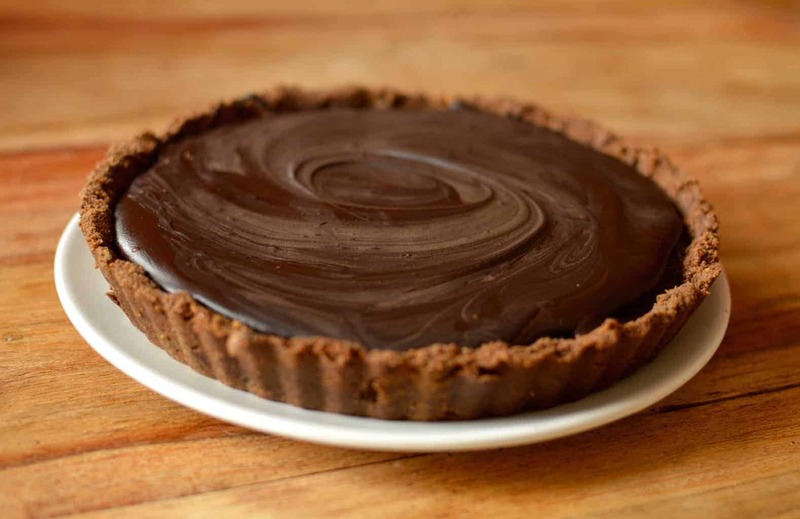 Below you’ll find the instructions for the sweet shortcrust pastry, but if you’re making this in more of a hurry, you can make the ‘throw all the fruit slices in’ approach even faster with a decent shop-bought pastry. You’ll lose a certain something by not making the pastry, but if it’s a choice between pre-made pastry or no galette, then know that you deserve galette in your life. This is a really easy summer dessert that always goes down a treat. If you’re looking for a crowd pleaser, this is your answer. 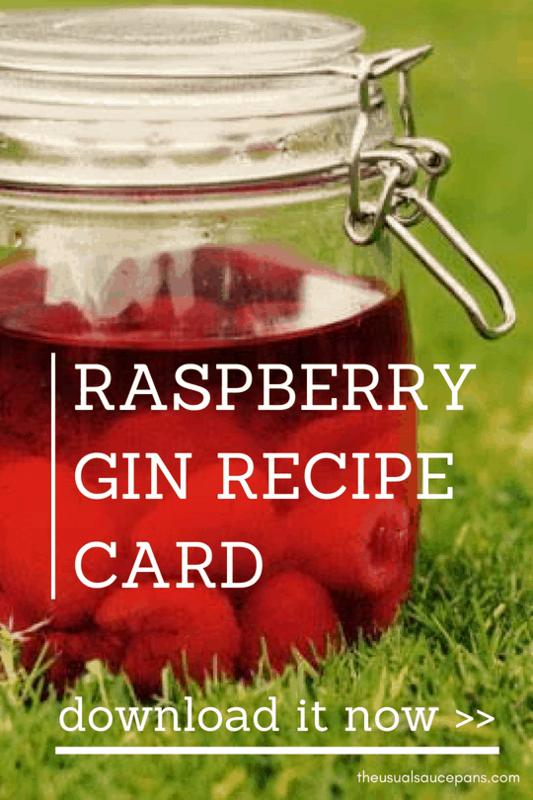 It’s also a great base recipe to use for other fruits – like apples, raspberries, plums, you name it! Serves 6. Start by making your pastry: add the flour, brown sugar, salt and butter in a large bowl and mix together with an electric mixer until it has a breadcrumb-like texture. Crack your egg into a dish and whisk with a splash of milk, add about three-quarters to the pastry (the rest will be a glaze). Mix gently until it starts to come together. You can also do this in a food processor, but be careful not to over mix it. If the mixture doesn’t look like it is coming together (not all eggs and flour measurement is created equal), add in a couple teaspoons worth of milk. Chop your peaches and apricots into thin slices. Add the chopped fruit to a bowl with the lemon juice, cornflour, cinnamon and any juices that have spilt onto the chopping board. Mix gently with your hands. Roll out your pastry to a circle approximately 30cm (12 inches) across. Leave a six-centimetre gap on either side (so you can fold over the edges), then add in your fruit. If you’re doing the slices in neat circles, do a rough layer and then a much more precise layer on top – with a little overlap with every slice of fruit. Fold over the pastry sides. Paint the top with the egg wash glaze mixture and then scatter liberally with demerara sugar. Bake in the centre of the oven for 35-40 minutes, or until golden on the edges. Cool for about 10 minutes on the tray, then transfer to a wire rack to cool completely. 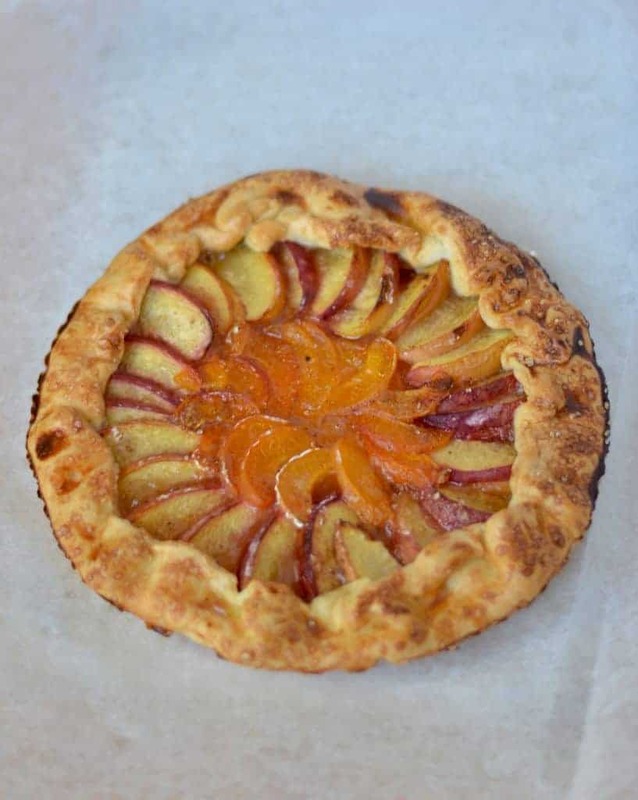 This recipe is great for all sorts of fruit galettes. I’d recommend looking at apples, raspberries, plums and strawberries.